let's talk about black-eyed peas. not the band, the food. black-eyed peas really are not peas at all. it's funny that we call them peas when they are actually beans. regardless of their identity crisis, they are great in a salad. 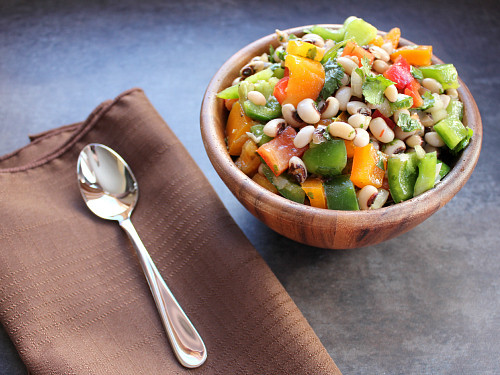 this salad is full of black-eyed peas, three different colored peppers, fresh cilantro, and a tad of onion. the whole salad is topped off with a lime balsamic vinaigrette which compliments the fresh veggies perfectly! it's a light and refreshing salad with a whole lot of nutritional value too. 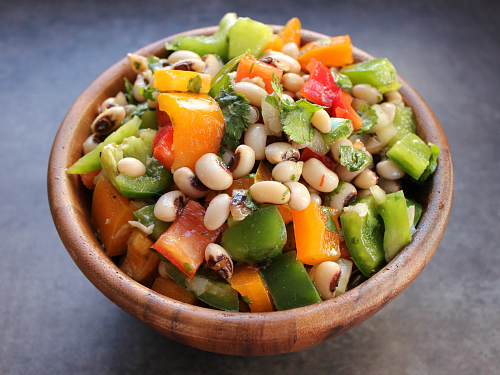 to make the salad: in a large sauce pot, combine the water and the dry black-eyed peas. bring the water to a boil and cook the black-eyed peas for approximately 30 minutes, or until they become tender. drain the black-eyed peas and rinse well under cold water. place the black-eyed peas in a large bowl and allow them to cool. add the chopped cilantro, onion, and peppers. to make the dressing: zest and juice the lime. in a small bowl, whisk together the lime zest, lime juice, vinegar, and olive oil. add the dressing to the salad, and toss well to combine. season with salt and pepper to taste. What a great, simple, healthy recipe! Thanks for sharing, Laurie!